The Kiwanis Club of Corpus Christi and the Corpus Christi Fire Department joined together Thursday afternoon to name their firefighter of the year. 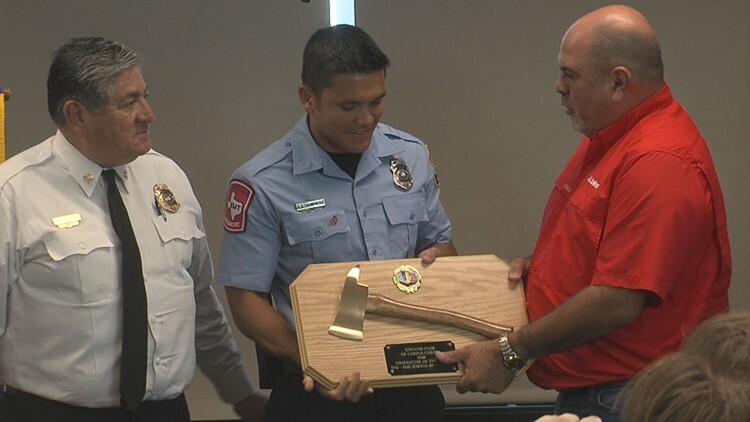 Corpus Christi (KIII NEWS) — The Kiwanis Club of Corpus Christi and the Corpus Christi Fire Department joined together Thursday afternoon to name their firefighter of the year. Joshua Brunemeier was given that honor by his superiors who say he is unselfish in his duty and symbolizes the best. Brunemeier has served in the department since 2013. He credits this award to the hundreds of other firefighters he's worked with in the Coastal Bend. "You know a lot of this honor comes from them, you know, I've learned a lot from the top to the bottom. You know, to be firefighter of the year like I said I've just learned so much from everyone in the fire department. You know we just have great men and women in this fire department," he said. Brunemeier adds he will put the plaque up in his house as a reminder to always put in 100 percent every day to his job.